This cover, ugh. So beautiful. All right, enough's enough. I've been hinting about how much I loved (and cried over) Tell the Wolves I'm Home for weeks now. Maybe I should actually review this book already. 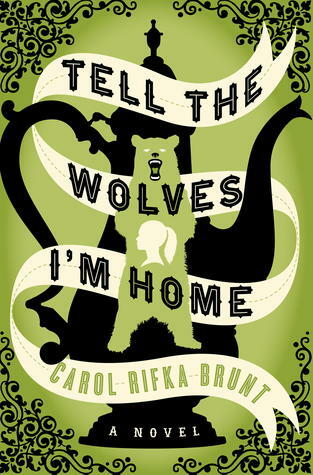 Carol Rifka Brunt's debut introduces us to fourteen-year-old June Elbus, a lone wolf of a teenager growing up in the early '80s in upstate New York. She has a penchant for the medieval and for spending time with her beloved uncle Finn. These days, with her parents busy at work and her older, more "talented" sister Greta becoming way too cool for her, June thinks Finn might be her only friend. This is just fine by her—that is, until Finn finally loses his battle against AIDS. The bulk of the story is June taking the reader through her final days with Finn (including his painting a portrait of June and Greta that serves a key role throughout the book) and the months after his death in which she connects with Finn's partner, Toby, heretofore hidden away from her. I ached for her as she stumbled her way through the aftermath of Finn's death and realizes just how much of the uncle she knew was actually Toby shining through him. She also grapples with the fact that what she felt for Finn (and, eventually, for Toby) may not have been entirely familial. As a gal who had a totally weird crush on her "cool uncle" as a child, this examination of how confusing love (and all its different manifestations) can be when you're young really hit home with me. We also watch June come to terms with the darkest parts of herself (the "wolves," if you will): a searing jealousy of Toby's relationship with Finn and her anger over the loss of her close relationship with Greta. Exploring the inner workings of a teenager dealing with multiple kinds of grief is ambitious, and Brunt's writing felt authentic in a way very few books achieve. "The sun kept on with its slipping away, and I thought how many small good things in the world might be resting on the shoulders of something terrible." —pg. 233, ibid. This isn't to say the book is perfect. If you look hard enough, there are plenty of things to pick apart. Some of the characters are woefully under-developed (I might have missed it, but I'm pretty sure June and Greta's father was never even named), and certain aspects of the ending, while touching, seemed out of keeping with the rest of the story. I read this for a book club, and one of its members said it well when he told us he loved the book, but he doesn't know if it would "hold up under scrutiny" or that he'll ever be inclined to re-read it. I'm not sure this one will warrant another reading for me, either, but I know one thing for sure: I'll look back on this first reading with utmost fondness. There's so much more I could explore about this book—sibling relationships! parental pressure/expectations! AIDS hysteria in the 1980s!—but I'd much rather you just read it for yourself. If you like stories about love, grief, families, or being a teenager trying to survive the messiness of life, I implore you to pick this one up. oh I loved this book too! June just broke my heart. This has been on my TBR for awhile, and this review makes me want to read it sooner rather than later! I loved this one, too. I think it just caught me off guard...I didn't expect to be so wrapped up in it, but I loved the story and the time period and bam...punch in the gut. I remember seeing this book around awhile back and I think I even added it to my TBR list...then promptly forgot about it! But, I love the writing style of the quotes you shared. Maybe i need to move it back on the radar. I have fond memories of reading this too - it was SO good and so sad and I was so invested in it while reading. I don't think I'll re-read it, and I think I like it that way. RIGHT? She just felt so real to me. Do it! It's so good, and you won't want to put it down. Ugh, I know. Like I said, I really don't often cry during books, but this one had me full on ugly at one point. Yes, do so! It's really a wonderful, heartbreaking story. Yes, same here. I think the one reading was enough in a completely satisfying way! I really liked this one too. I loved the point of view choice and June was just such a good and bright character. My heart ached on several occasions while reading it...mostly for Toby, but also for June and for Finn. Okay. You officially have me interested. I completely know what you mean about aching for Toby... this book grabbed my heart early on and wouldn't let go!